“I learn a new thing every single day.” From crawling on your stomach watching insects and studying their behavior, to crouching on your haunches as a herd of elephant walk past while getting on with their daily ritual, everything in their own way is struggling to gain the upper hand of success and survival in nature. I love having the privilege of being able to spend three hours on foot identifying tracks and interpreting behavior from them. Only to realize you are no more than two hundred meters down the road without having seen a single thing, other than the signs left behind. This can be engaging enough to give clients a new insight into nature, how it works and why. I don’t have a favorite animal and can’t give you a field that I specialize in more than the next. I am still as awestruck from an hour with impalas, or watching a dragonfly emerge as an adult as its wings slowly expand and pulsate with life until it can fly away and continue its fight for survival as I am with a pride of lions beginning an evening hunt as darkness closes around the bush. It’s not about the job or a career, game rangers simply live their life doing what they can’t do without. That is why I am who I am. 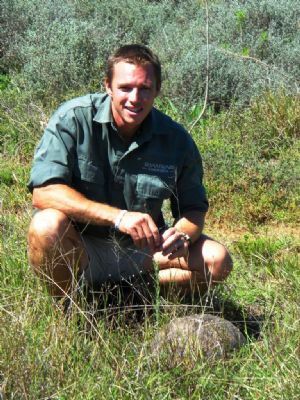 Andrew Kearney is the Head Ranger at Shamwari Game Reserve, as well as our resident field guide instructor and certified FGASA assessor. He has more than 12 years of experience in the guiding industry and is an accomplished guide and well regarded assessor within the industry. He has guided, trained and assessed throughout South Africa and has an intimate knowledge of the natural fauna and flora that surrounds him, which inspires him to learn as much as there is to in this complex and ever changing natural world. Karien guides out of Riverdene Family Lodge. She is passionate about teaching the younger generation about nature and conservation. Westley has been with the Shamwari rangers’ team for about 7 years. Read all about his guiding experience at Shamwari in his Ranger Q&A. James is a brilliant ranger who predominantly guides out of Long Lee Manor. He is incredibly well-liked by guests and colleagues alike. His enthusiastic personality, sense of humour and zest for life make him a great member of the Shamwari Team.